where this year I tried new experiments in the use of 3D technology to document and visualize ongoing archaeological excavations. Last year I did tests on site using Image Based Modeling techniques to document the investigation of the building 89, in that occasion the team of the university of California Merced directed by Maurizio Forte, were running similar experiments using instead a phase shift laser scanner, they got interesting results and the use of both these techniques in the same excavation context gave us a very good feedback on how different technologies that produce similar results (resolute 3D model) obey to different work-flow of data capturing and post processing. After this tests we gain a good knowledge on how making these tools compatible with ongoing excavations and how to manage the data in a reasonable time frame. At the end of the first season (2011) It was possible to visualize in the same platform (MeshLab) the temporal sequence of most of the units found during the investigation, moreover thanks to a total station grid provided by the survey team who operated during that season, it was even possible to geo-reference all the models realized during the campaign. The first year was very successful, especially for what concern the creation of a functional work flow to use during the investigation process, but very few questions about archaeological methods came out. 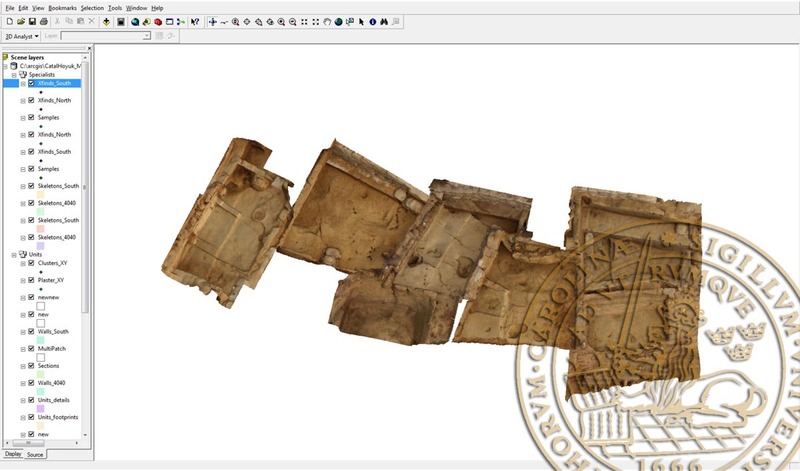 This happened probably because we could not visualized our models in the same platform where all the other data were stored: the GIS system of the excavation. After the first season of experiments we figured it out that Image Based Modeling techniques represent today the best solution to generate 3D models of the ongoing investigation, in fact the accuracy and precision of this methods has been proved to be more than enough for any archaeological documentation, moreover using powerful laptops it has been possible to produce in few hours (sometime even in 45 minutes) complete 3D models of the buildings. 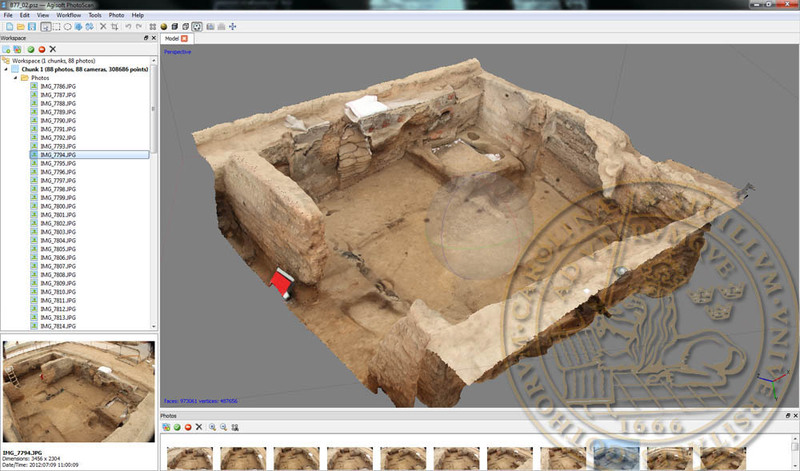 This year together with UCM we decided to mainly use this method (image modeling techniques) for the documentation of the ongoing excavation, laser scanner technology instead was mainly employed for the documentation of the entire site with point's clouds. The results were really interesting! In fact it has been possible to work on several buildings at the same time and geo-reference all of them in the same space, moreover with the help of Camilla Mazzucato, researcher at the university of Oxford, we handle to transform the 3D models in features and finally visualize our work into the GIS system of the excavation (Arcscene) connecting each other data coming from different seasons and different teams. Together with James Taylor from the university of York, we started discussing how this will effect the field activities and we started brainstorming new workflows in order to integrate this approach into the documentation system in use in Catal. At the same time an interesting discussion started also with Scott Haddow from the osteology group that experimented new ways to use this technique in osteology, here some reference from his blog. Before the beginning of the campaign I had the chance to discuss with Åsa Berggren and Björn Nilsson about several possible scenarios, I think that these results represent the best starting point we could get to begin a new exciting research work. The results of this experiment open to new questions such as: how the use of this new tool will influence our way to perceive and interpret the data? How our work will effect the investigation of other archaeologists in the future? And... who will answer these question? Any news about 4D GIS in the last two years?